* This is my article in BusinessWorld last Tuesday. During the BusinessWorld Economic Forum held last May 19, Budget Secretary Benjamin E. Diokno showed two interesting charts: (1) sustained overspending and borrowings, budget deficit/GDP ratio from -0.9% in 2015 to -2.7% in 2016 then -3.0% from 2017-2022. And yet (2) debt/GDP ratio was expected to decline from 44.8% in 2015 to 40.2% in 2017 and further down to 36.7% in 2022. Is this possible? That one overspends and over-borrows and yet the debt/GDP ratio will keep falling? “Underspending” for me should mean that expenditures are lesser than revenues, resulting in a fiscal surplus. When expenditures are larger than revenues but the deficit is only at -1% or below -3% of GDP, that is still overspending, not underspending. So the previous administration did not really underspend, just that it did not go into an uncontrolled spending spree. 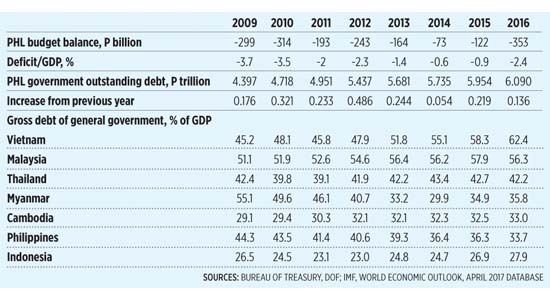 Here are relevant numbers about the Philippines’ fiscal position and levels of outstanding public debt, and comparative debt/GDP ratio of seven ASEAN countries (see table). One, the average deficit in the previous administration, 2010-2015 was only P185 B/year or -1.8% of GDP, benign and considered as “underspending” by many fiscal hawks, especially when compared with deficit in 2009 (last year of the Gloria Macapagal-Arroyo administration) and 2016 (first year of Duterte administration). Two, low annual budget deficit and borrowings in the same period means the country’s outstanding debt stock has risen only mildly, with the average of P260 B/year. Three, partly a result of this, the Philippines’ debt/GDP ratio over the same period showed significant decline, similar to the experience of Myanmar while other neighbors posted deficits, owing to increased borrowing. Fewer borrowing means less debt service payments for both principal and interest. It was during the same six-year period that Philippines’ GDP growth was 6.2% per year, much higher than Thailand’s 3.7%, Indonesia and Malaysia’s 5.7%, Vietnam’s 6.0%. In the same BW Economic Forum, the DoTr showed that these projects will be ODA (government loans) funded, not PPP. 1. PNR North Railway (Manila-Clark), construction Q4 2017 -- Q4 2021, P255 B. 2. PNR South Railway (Manila-Bicol), construction Q3 2018 -- 2021, P270 B (originally a PPP). 3. Mega-Manila subway (Phase 1, QC-Taguig), construction Q4 2019 -- 2024, P225 B. 4. Edsa-Central Corridor Bus Rapid Transit BRT (Edsa, Ayala, Ortigas, BGC, NAIA), construction Q1 2019 -- Q1 2021, P38 B. Other big projects were identified but it wasn’t specified whether these would be funded by official development assistance (ODA) or via Public-Private Partnership (PPP). In December 2016, DoF Secretary Sonny Dominguez already indicated that infrastructure projects under the Duterte administration will avoid PPP whenever possible. And the massive China and Japan ODAs came into the picture. Then there are tweaks in some major projects, from PPP to ODA. Like the PNR South Railway and the Kaliwa Dam project in Quezon province of Maynilad Water. What would pre-qualified players like San Miguel do with this policy reversal? The Dutertenomics’ spending plan is detrimental to taxpayers in general and the investment environment in particular, for the following reasons. 1. Bigger annual budget deficit would mean more government loans, higher public debt stock, and will lead to higher taxes now and the future to service those huge loans to be contracted. Soon the P6/liter increase in oil excise tax will not be enough, it will further rise. 2. Massive shift from PPP (private investment) to ODA of major infrastructure projects will result in more loans which mean more public debt, more taxes, and fees in the future.